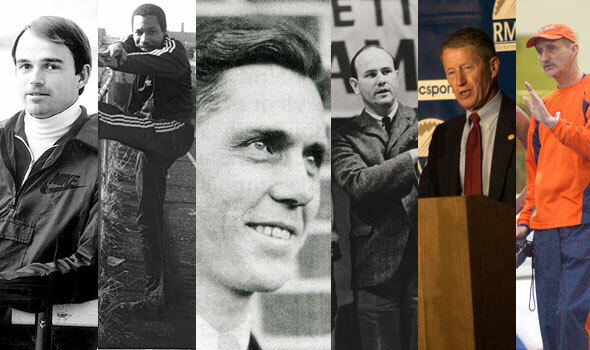 NEW ORLEANS – Each U.S. Track & Field and Cross Country Coaches Association (USTFCCCA) Hall of Fame induction class is defined by the achievements and accomplishments of its inductees. The 2009 version of the USTFCCCA Hall of Fame is no different as this year’s class is defined by “success”. From Arthur Gulden’s 68 cross country/track and field conference championships or Oscar Moore leading Rowan University (formerly Glassboro State) to five straight NCAA Division III Outdoor National Championships or Duane Vandenbusche coaching Western State to 12 cross country national championships, each coach to be enshrined in the 2009 USTFCCCA Hall of Fame has left an indelible mark on the collegiate cross country and track & field community. “Year after year I am overly impressed when reviewing the accomplishments and contributions of those coaches selected for induction into the USTFCCCA Coaches Hall of Fame,” said USTFCCCA CEO Sam Seemes. The USTFCCCA Class of 2009 consists of Gulden (Bucknell University), Franklin Pitcher “Pitch” Johnson (Drake University/Stanford University), Oscar Moore, Jr. (Rowan University), Charles (Chuck) Rohe (Furman University/University of Tennessee), Duane Vandenbusche (Western State College of Colorado), and Gary Winckler (Florida State University/University of Illinois). The 2009 Hall of Fame induction ceremony will be held December 16, 2009 at the USTCCCA annual convention in Orlando, Florida. Art Gulden was the architect of the Bucknell Bison track & field and cross country program, building the team into one of the most respected programs in the East through years of commitment, hard work, and sacrifice. During his 31 years at Bucknell, the Bison won an unprecedented 68 conference titles, including 18 straight in cross country. Gulden-coached teams also won three men’s IC4A championships. Nationally, Gulden led the men’s cross country team to nine cross country championship appearances in 21 years. Gulden’s success was noticed by his coaching peers, as he was named the Patriot League Coach of the Year 20 times during his career. Gulden passed away on May 19, 2001 and was posthumously inducted into the Bucknell Athletics Hall of Fame, where he is enshrined alongside more than a dozen of his former pupils. Franklin Pitcher “Pitch” Johnson, Sr.
Franklin Pitcher “Pitch” Johnson’s contributions to the sports of track & field and cross country extend far beyond his successful coaching career. Johnson helped establish the fledgling National Collegiate Track Coaches Association (NCTCA), serving as an officer from 1933 until his retirement from coaching, including a three-year stint as President (1935-1938). As a coach, Johnson put Drake University Track & Field on the map as head track & field coach from 1928 to 1940 and director of the Drake Relays from 1933 to 1940. Under his guidance, the Bulldogs earned ten team conference championships in track & field (six indoors and four outdoors), won 30 individual Missouri Valley Conference titles, and finished third (1938) and fourth (1939) in the first two years of the NCAA Cross Country Championships. Johnson ended his coaching career at Stanford University, serving as head track & field coach from 1940 to 1943. Rowan University’s (formerly Glassboro State) Oscar Moore, Jr. began the school’s men’s track & field program in 1971 and had immediate success. The men’s program became a mainstay at the NCAA championships, competing at the NCAA Division III Championships for 20 straight years under Moore’s guidance. Rowan earned runner-up honors in 1978 and 1979 before putting together a string of five-straight outdoor track and field titles from 1980-84. Moore’s 1982 NCAA championship team still holds the record for most points scored at the NCAA Division III Outdoor Track & Field Championships with 119 points. Rowan’s five outdoor track and field national championships are the third-most in Division III. Moore-led squads won 19 straight New Jersey Athletic Conference titles, earned over 130 All-American honors, and won 24 NCAA individual titles. Moore was named the NCAA Division III National Coach of the Year every year from 1980-1984. Regarded as the “Father” of track and field in the South, Charles “Chuck” Rohe was the link between football players and track and field athletes while at Tennessee. He began his storied career as the Head Coach at Hattiesburg High School, then moved on to Furman University before taking over as the men’s Head Coach at the University of Tennessee. At Tennessee, Rohe led the men’s team to 21 straight cross country and track & field SEC Conference Championships. He had six top-ten NCAA Championship finishes, and he coached three NCAA Individual Champions, 53 SEC Indoor event champions, and 49 SEC Outdoor event champions. Rohe was named the 1967 NCAA National Coach of the Year. Few might have guessed at the outstanding career that would follow when Duane Vandenbusche, then a history professor at Western State, began working with a struggling Mountaineer track & field program in 1972. Three years later, Vandenbusche took the reins of the cross country and track & field program and began to build a national powerhouse. By the time Vandenbusche retired in 2007, the Mountaineer men and women had won 12 national team titles in cross country (10 NCAA Division II and two NAIA), captured 51 individual national championships in track & field and cross country, and earned over 300 All-American honors. Vandenbusche earned a total of seven National Coach of the Year honors over the course of his career at Western State. Track & field was more than just a sport to former Illinois and Florida State women’s track & field head coach Gary Winckler, it was an opportunity to help young women succeed both on and off the track. Nationally regarded as one of the nation’s most premier coaches, Winckler’s Illinois teams regularly battled for Big Ten Conference Championships, winning a total of 11 during his time in Champaign. He was named the Big Ten Coach of the Year 11 times, the 2007 USTFCCCA Midwest Region Outdoor Track & Field Coach of the Year, and was named NCAA Division I Coach of the Year three times. Winckler coached athletes earned 266 Big Ten individual titles and over 175 All-American honors. Dating back to 1992 Winckler has had an athlete compete in every World Championship and Olympic Games. Prior to his arrival on the Illinois campus Winckler coached at Florida State University, leading the Seminole women to the 1984 NCAA outdoor title and the 1985 NCAA indoor title. His 1984 team scored the second-most points (145) in NCAA history at the women’s outdoor championships. Winckler coached over 100 All-Americans while at Florida State.